We’ve all been there. But, it doesn’t have to be that way. 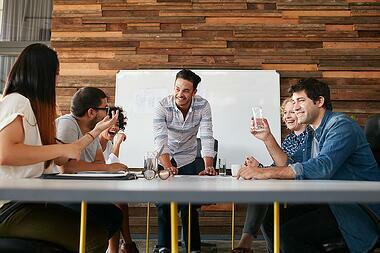 Check out our list of 10 things you can do TODAY to make your work meetings more efficient. Meetings should be exclusive, like those fancy airport lounges that we all love. Before you send a scheduler ask yourself if EVERY invitee is a vital part of this conversation. In many cases, you can cut the guest list by removing team members that are not an integral part of the discussion. Cutting the list doesn’t mean cutting them off from information – send a post-meeting recap and allow them to spend time on actionable items that require their specific attention. If there is ONE takeaway to hold on to – this is it! Agendas are the warden of meetings (pun intended, since meetings sometimes feel like prison). Agendas should clearly and briefly detail discussion points and transitions. Navigate Around Hiccups – Someone isn’t prepared? Presentation won’t load? Team member called in sick? Don’t waste time waiting, just move to the next point and revisit the skipped content at the end. Remember Everything Important – It’s frustrating to spend 45 minutes in a collective meeting just to have someone come to your desk after asking about/assigning something they “forgot to mention”. Help People Organize – Agendas can serve as a brainstorm tool for your team. Identifying what you will cover in the meeting, helps team members anticipate what they might need to comment on. Team members can note “talking points” on their agendas so that they make sure they communicate all relevant information to the team. Even when we time-manage to the best of our ability, sometimes discussions take a bit longer than anticipated. Make sure that the most important information is discussed at the beginning of the meeting – that way, if you to have to cut things short, only smaller things are left outstanding. (PRO TIP: I like to color-code things (RED, YELLOW, GREEN). Color coding communicates a visual sense of urgency; I find that, typically, people come more prepared to speak to those “RED” and “YELLOW” items). Punctuality is professional. Sure, sometimes people get held up. But we can’t be sure if that “2 minutes late” text will turn into “20 minutes later…” If there is anything that you can cover until the delayed attendee arrives– do it. (See: Navigate Around Hiccups) No need to hold up an entire team, because one person is running behind. Time is valuable! Send reference materials ahead of time. And I’m not talking 5 minutes before! Distribute relevant information to the team for review 24-48 hours allows sufficient time for everyone to get up-to-speed. Not having to walk-through every single document during the meeting cuts time and amplifies the efficiency of the meeting by allowing the team to focus on WHAT’S NEXT! “Too Many Chiefs, not enough Indians.” This is the unfortunate hierarchy of way too many meetings – 1 hour of input, no output. The remedy: Take back the throne! Every meeting should have a “leader” responsible for keeping the group on track (with the help of the agenda). This person shouldn’t be afraid to interrupt tangents, prompt participation, and challenge the group concerning outstanding deliverables. Designate an authority that won’t allow Glenda from Purchasing to hijack the conversation about an upcoming event with her promotional item comparisons when that can be discussed off-line. Think: Taboo. You know, when the sand-filled hourglass empties and “that girl” from the opposing team screams “TIME!” Be THAT girl (or guy)! Include times in your agenda, and have someone monitor those times throughout the meeting. Having someone responsible for time management helps the team to not get stuck on one thought and pushes everyone to keep moving forward through the agenda. As King or Queen of your meeting castle, feel free to manipulate the agenda (if needed) to better accommodate the team. Here’s a tip - If you only need me for ONE item, let me go first! Ex: Andy is our resident Graphic Designer. He has one, small update for this project and is working to put out a fire for another client. Don’t make Andy wait until the very end of the meeting to say, “I’ve finished my mockup and sent it to the client for approval”. Be sensitive to people’s time – if you can allow a team member to drop off toward the beginning and focus on something more pressing then do it. One more thing off of both of your lists. End every meeting by setting expectations! Use the last 5 minutes for a verbal recap of the meeting with your team. This is a great way to “double check” your notes, and be sure that nothing gets left out of your recap. If there is any content that you didn’t have the opportunity to discuss – put a stake in the ground for when the follow-up meeting should occur. Who knows, when the meetings run this smoothly a few people might be willing to stay a little after. Following the meeting, send an electronic summary/recap to the team. Don’t forget to include those people who weren’t in attendance, but can still benefit from the info. Be clear about next steps, assignments and deadlines. Recaps are a great tool to hold yourself and your team accountable. When everyone is clear about the expectations, their role & responsibilities as they relate to those expectations, and the timeframe that they have to complete said task – you’ve laid the foundation for one efficient and effective team! Looking for more ways to improve your team’s efficiency? We have some advice for you.